What makes a good microphone? Let's face it, not all microphones sound the same. So it is wise to have several different kinds in your studio collection. Certain artists sound better with certain microphones. Also keep in mind that a good studio engineer can get a pretty good recording with a $100 mic or a $5,000 microphone. As long as you get a good solid vocal recording and solid mixing skills you will be surprised with what you come out with in the end. I am not saying that you should only use cheap microphones but you do not always need the high end microphone to get the job done. For studio recordings you will want a condenser microphone. You may be wondering how a condenser microphone works? 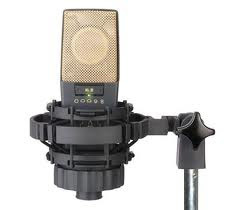 A condenser mic is a thin stretched conductive diaphragm held close to a metal disk called a backplate. This produces a capacitor, and is given its electric charge by an phantom power which comes from a mixer or DAW, but sometimes condenser mics have dedicated power supply units. When an instrument or vocal hits the diaphragm it vibrates. This causes a variance in its output voltage. This voltage variation is the signal output of the microphone. All condenser microphones are based on these basic principles. Through trial and error you will find what mic works best in whatever situation. Condenser microphones are very responsive and create a much stronger signal than dynamic mics. This makes them an ideal choice for professional settings such as studio work, where it's important to pick up vocal subtleties. These mics are best suitable for recording studios.